Relax by Beach by Day...After Spectacular Sunsets..Be Lulled to Sleep by Waves..
Beach gulf-front condos nestled right on the beach. Huts, or just relax in the sun. Island's best has to offer! wonderful. We spent most of our time at the beach during the day! 'I just wanted to thank you and let you know we had a great time. In washer/dryer room on ground floor. In washer /dryer room on ground floor. Fitness gyms on island for rental. Fully equipped kitchen with updated appliances. Some board games and puzzles and cards. Bike and scooter rentals on island...about 1 mile from condo...bike rakes provided under the condo buildings.. Rentals available on island...boats and pontoons of all sizes...also sport fishing trips available..
Short 2 mile drive on island ...and many more public courses off the island.. Screened Lanai (Balcony) Fully Equipped Kitchen including Dishwasher & Microwave Attractions all within a short drive or a day trip: Edison's winter home..Everglades..Sannibel/Captiva islands..Naples & high end shopping & even more restaruants...Key West ferry ...sport fishing..island bike or scooter rentals...lovers key wildlife refugee state park.. Wireless Internet Laundry on premises Heated Pool 4 Barbecues Tiki Huts Recreation Room Picnic Tiki Huts Putting Green Shuffleboard ELEVATORS Estero Island Trolley stops right outside our door! Publix grocery store is just 3 blocks away Public tennis courts right 5 minutes to public school..
We had a wonderful time at this condo. The owner, Art, was wonderful to work with - very friendly, prompt and answered all my questions thoroughly. The condo was beautiful, very clean and exactly as described. The pool, grassy area and tiki sitting area with grills were nice and clean. The views of the Gulf were spectacular! This condo is more in the middle of the island, so it’s nice and quiet and just a trolley ride away to the action in Fort Myers Beach . We really enjoyed our stay and hope to be a back someday ! Everything was clean but old. From the outdated furniture to the old, faded bedding. Looks like it hasn't been updated in decades. Well equipped but crowded with old, oversized furniture. Wouldn't take much to make the place look much better. Bathrooms are tiny and so is the kitchen. It needs re-done. This is an immaculately maintained and managed complex. We were on the third floor. No one can have any complaints about the common areas at this location. The pool is spotless, the grounds are perfect, the hallways and laundry areas are perfectly cleaned & the landscaping is excellently manicured. There is not much to say about a perfect beach other than it is breathtaking. Mid Island is a great location on the island. The weather was perfect - we were there for Christmas and New Year’s. We found the traffic to be extremely light this year – can’t explain why. We’ve been going to Fort Myers Beach for more than 15 years every single winter. The weather was also perfect. Our unit was very clean. The view was outstanding,morning coffee on the lanai was out of this world,as well as lunch.This condo was perfect for us,very nicely equipped with everything you need or want is there.Thank You so much for sharing it with us. Dave & Tana! 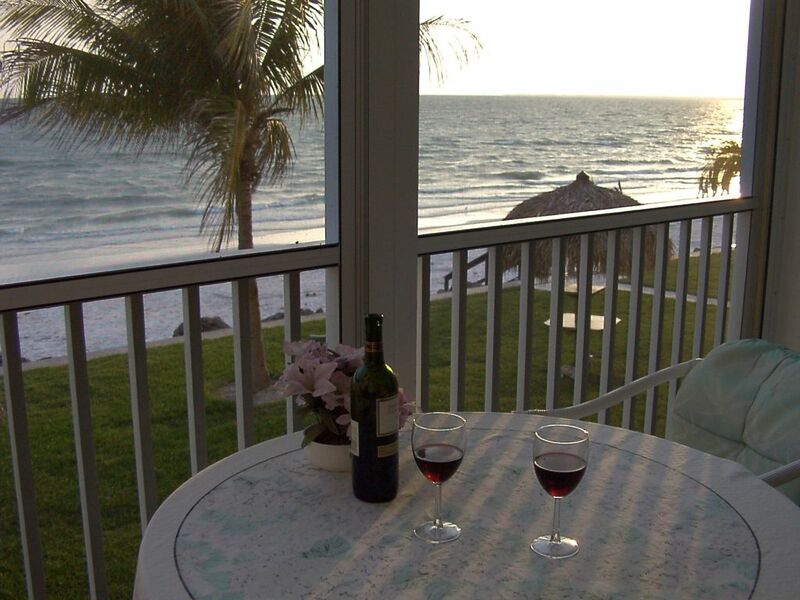 It was right on the beach and could hear the ocean waves on the balcony. It was convenient to the grocery store. You could go one direction and be to Lovers Key or the other direction to the beach pier in less then 15 minutes. Everything you would need was furnished in the condo. Overall a great experience. Spring Training location for Major League Baseball!